The U.S. demands that Pakistan’s Directorate of Inter-Services Intelligence (ISI), its spy agency, sever relations with the Taliban. Based on Pakistan’s own geography, this makes no sense from a Pakistani point of view. First of all, maintaining lines of communications and back channels with the enemy is what intelligence agencies do. What kind of a spy service would ISI be if it had no contacts with one of the key players that will help determine its neighbor’s future? Mr Kaplan arrives at these conclusions because he fundamentally misunderstands both the ISI’s relationship with the Taliban, and the threat they pose to the interests of the Pakistani state. There is a huge difference between “lines of communications and back channels” that all intelligence agencies have, and the cat-and-paw relationship between the Pakistani military establishment and the global jihadi groups. To use Mr Kaplan’s analogy, while the US used the “back channels” of the PLO to help evacuate American families from Beirut, the CIA—to our knowledge—does not use Palestinian terrorist groups to carry out terrorist attacks in Jerusalem. What needs severing is not the ISI’s lines of communications, but its use of the Taliban as a strategic proxy. But Mr Kaplan’s greater mistake is the acceptance of the notion—that even some Pakistanis reject—that the ISI’s cat-paw relationship with the Taliban is in Pakistan’s interests. It is not. The Taliban pose the most serious threat to the survival and security of the Pakistani state. This fact is dawning on more and more Pakistanis. Yet, it escapes Mr Kaplan. The interests of the Pakistani military-jihadi complex are not quite the same as that of the Pakistani state. Mr Kaplan, however, conflates the two, and, unfortunately, ends up with a conclusion that could not be more wrong. Actually, the relationship between the military establishment and jihadi groups has gone even beyond that of patron and client. It is now appropriate to consider them a military-jihadi complex. It is this complex that the United States must seek to dismantle. To equate the problem to mere lines of “lines of communications” is laughable. Related Post: Robert Kaplan misses the plot: his earlier piece arguing that the ISI’s insecurities must be assuaged. So instead of “simplistic” talk of “sending more American troops to Afghanistan”, Mr Kaplan recommends “vigorous shuttle diplomacy between Kabul, Islamabad, and New Delhi to address India’s and Pakistan’s fears about Afghanistan.” Mr Kaplan doesn’t say what the diplomacy will be shuttled around, but judging by his argument that the ISI must not be angered, it would perhaps entail the United States asking India to scale down its relationship with Afghanistan. Mr Kaplan is a self-described realist. But the problem is that his policy prescriptions are based on an incomplete analysis of the situation. For instance, he correctly points out that America’s “interests are now more or less aligned with those of the Soviets 20 years ago.” But he then abandons realism when he says, in the next sentence, “but rather than repeat their mistakes, we need to strive to prevent Pakistan from turning into the enemy of the American-backed government in Kabul”. Mr Kaplan fails to grasp the reality that any regime in Kabul—whether independent or backed by an outside power—will remain at loggerheads with Pakistan. It’s not only the Indian influence that the ISI is angry with. It is first the American influence. It is also the reason why Pakistan was a FATWAT and a backer of the Taliban at the same time for the last seven years. So what does realism suggest for the United States? Well, as Mr Kaplan says, it should not repeat the mistakes made by the Soviets. One reason the Soviets lost that war was because they didn’t (and couldn’t) credibly threaten to attack Pakistan. 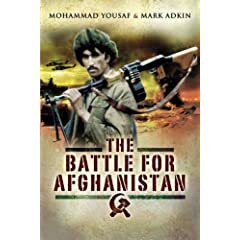 The only way the United States can win the war is to create a balance of power in Afghanistan where the Pakistan—despite an angry ISI—cannot destabilise the Afghan government. And that is pretty much aligned to India’s interests too. Related Posts: Nikolas Gvosdev and Joshua Foust get it. Update: Pragmatic Euphony covers recent posts and articles on this theme. Brigadier Yousaf does not say whether and how often they wash it.